Notes: Chain links are 3x3.5mm, 23ga, with a 2mm ID. Chain link inner diameter will accommodate 16ga jump rings or smaller. 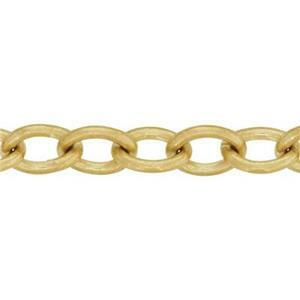 Bulk chain is priced per inch. All chains are sold in 12 inch minimum quantities unless a 10 foot minimum is noted. We may use segments of 7 inches or longer to fulfill your order if continuous lengths are not available. Spooled lengths are segmented at the factory so we cannot guarantee continuous lengths of any specific measure. I just bought this chain this week and I love it.